I boarded Caltrain and traveled 30 miles south, from its northern terminus at 4th Street in San Francisco to the Palo Alto Caltrain Station. 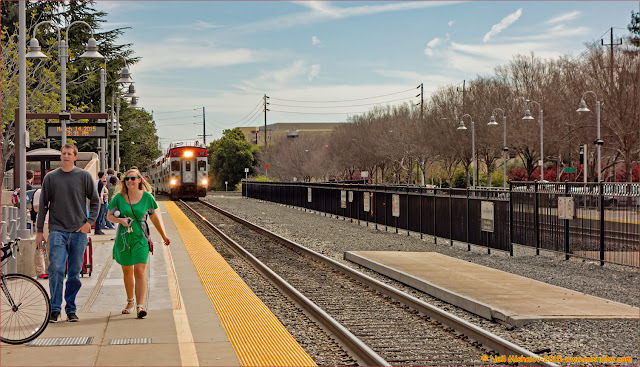 This is a photograph taken from the San Francisco 4th and King Street Caltrain Station. Click on the image to see the full-size photograph. The distance traveled on Caltrain was approximately 30 miles. Mile markers are displayed on the GPS generated track. Click on the image to see the full-size map. 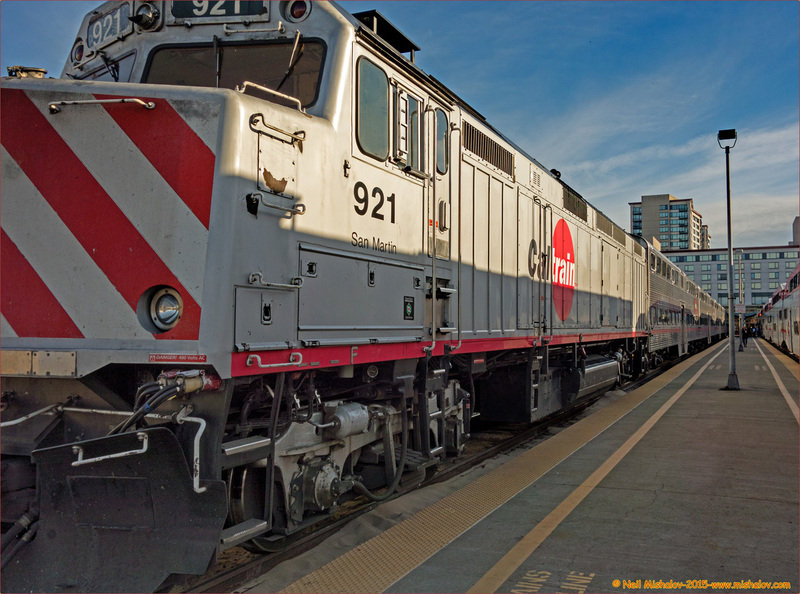 This picture was taken as the train was traveling south, towards Palo Alto. 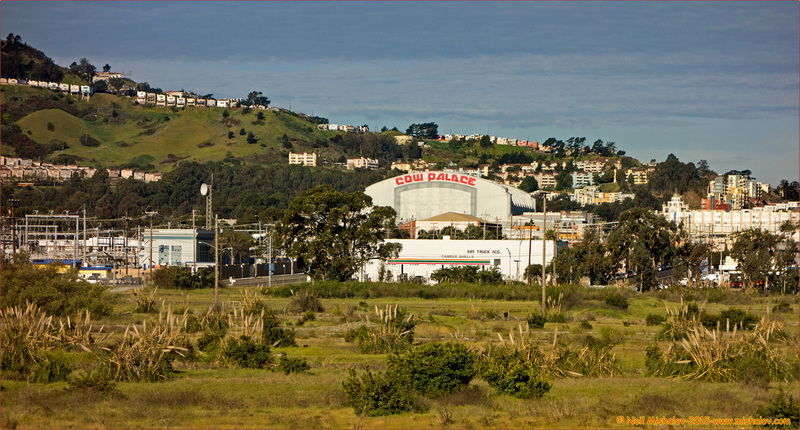 The Cow Palace, located in Daly City, has had an interesting and eclectic history. In 1956 it was the site of the Republican Party National Convention. The Republicans nominated Dwight David Eisenhower to be President for a second term. In 1964, the Republican Party again held their National Convention at the Cow Palace; at that time they nominated Barry Goldwater to be President. This view is looking west. Click on the image to see the full-size photograph. 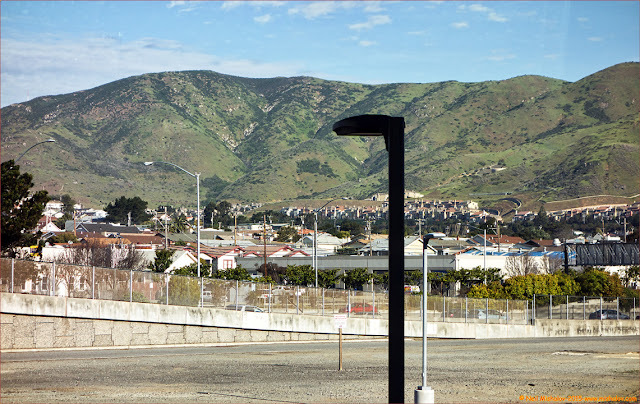 This picture was taken from the train as we were passing through South San Francisco. 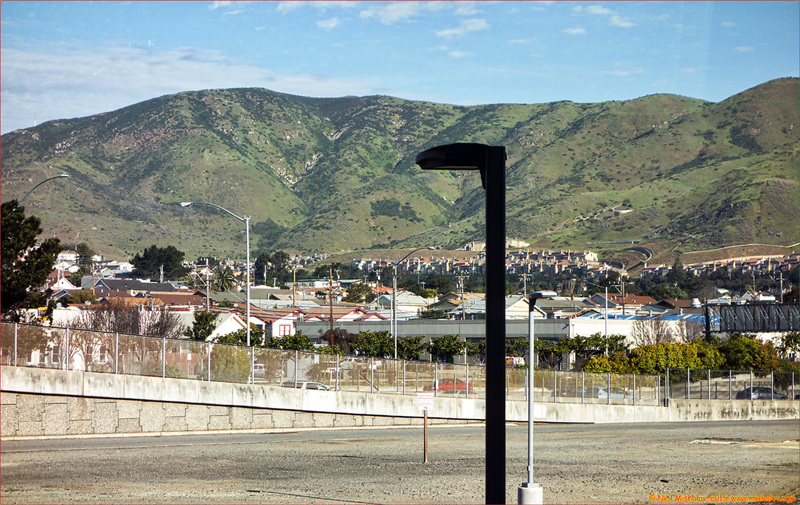 The hill is San Bruno Mountain and the view is looking northwest. Click on the image to see the full-size photograph. 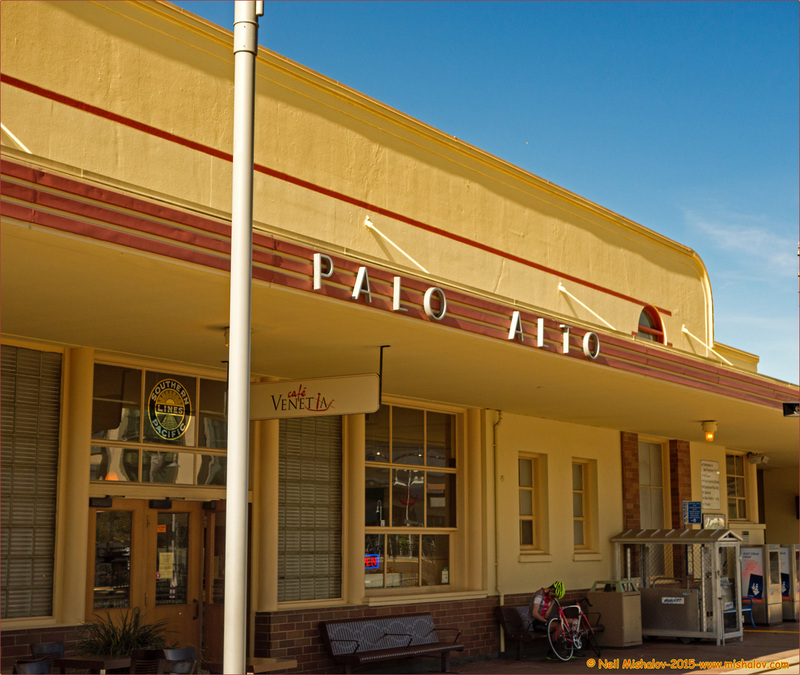 This is the Palo Alto Train Station. Palo Alto, located in San Mateo County, has a population of approximately 66,000 people. 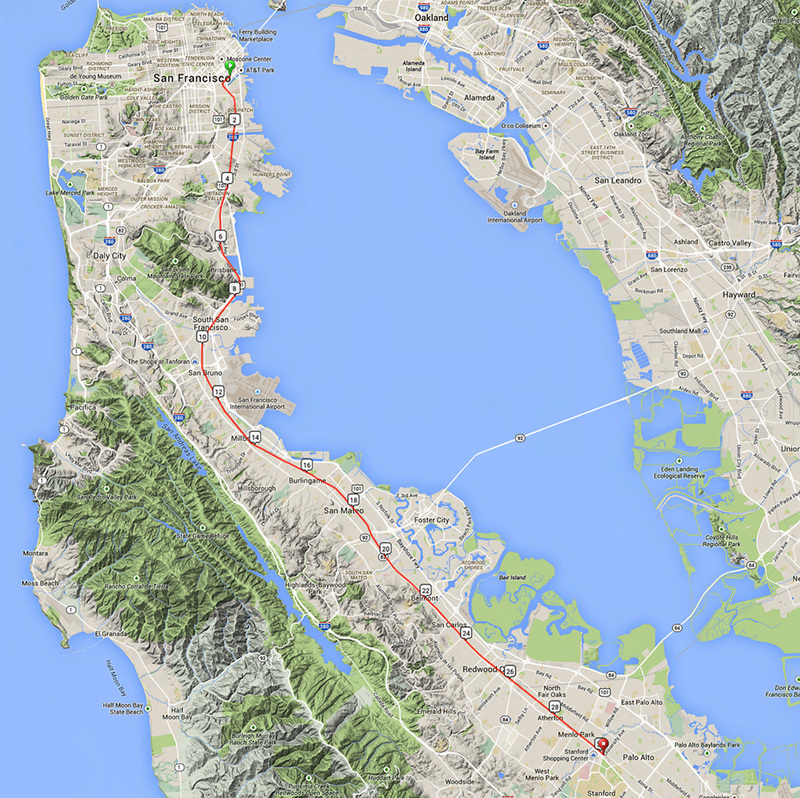 Stanford University is adjacent to, and west of Palo Alto. Click on the image to see the full-size photo. Steve Jobs, a co-founder of Apple, lived in Palo Alto for the last twenty years of his life. 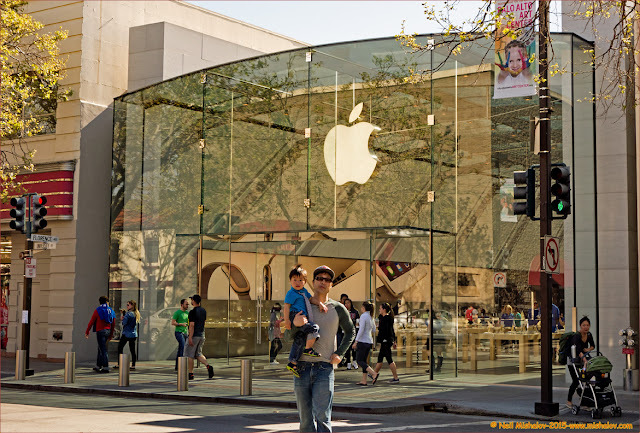 His Palo Alto home is located approximately 1.5 miles from this Apple store, which is sited on University Avenue in Palo Alto. Click on the image to see the full-size photograph. 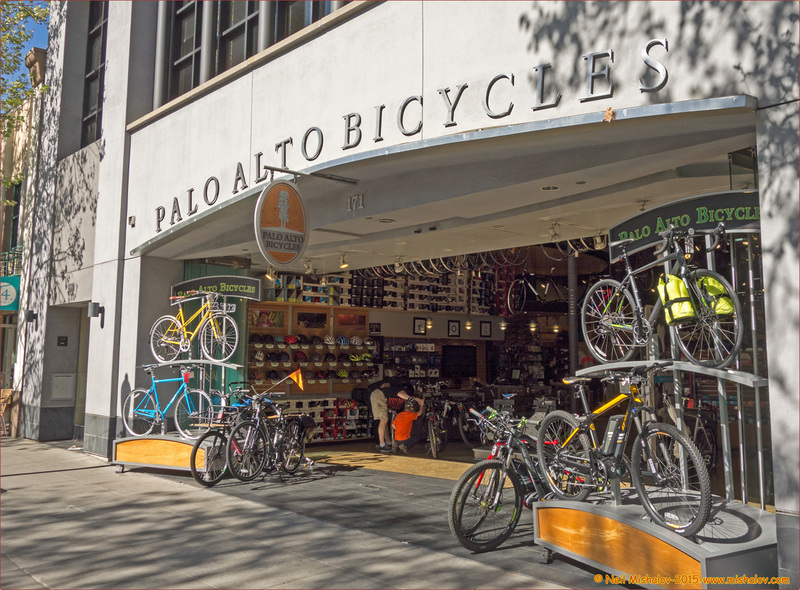 If you are a serious Bay Area bicyclist, then you have probably heard of Palo Alto Bicycles. Click on the image to see the full-size photo. Ah yes, the Stanford Theater. 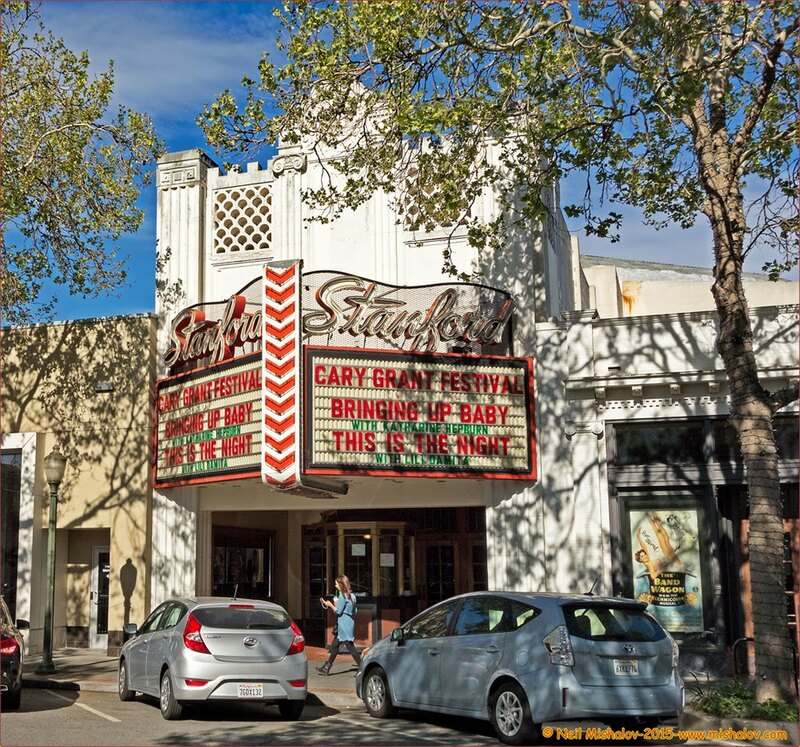 The Stanford Theater first opened its doors to movie-goers in 1925. In 1987 David Woodley Packard, the son of David Packard a co-founder of Hewlett-Packard, purchased the theater and restored it to its original grandeur. This is a great theater in which to view high-quality versions of movies made between the 1930s and the 1970s. Click on the image to see the full-size photograph. This is one of many humorous murals painted by the late Greg Brown throughout the downtown area of Palo Alto. 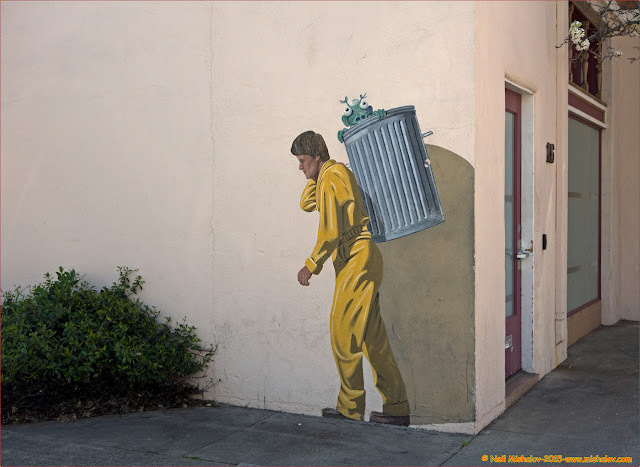 Mr. Brown started this project in the late 1970s, and most of his murals still remain. Go Here to see more of his amusing work. Click on the image to see the full-size photo. 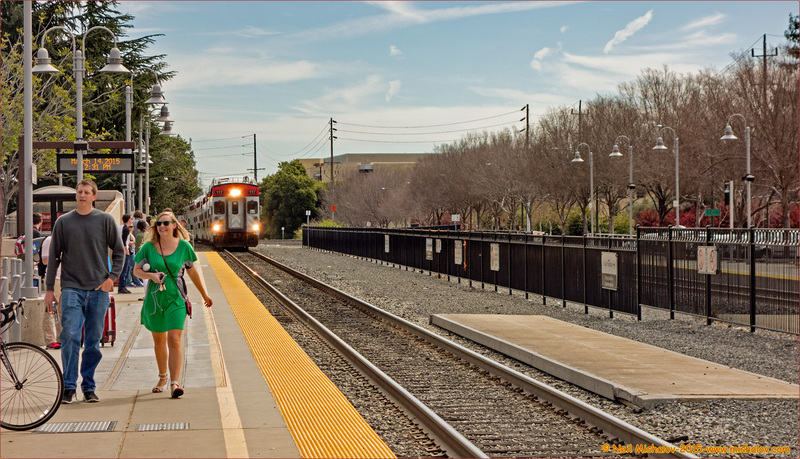 A train traveling to San Francisco is entering the Palo Alto Station. This view is looking southeast. Click on the image to see the full-size photograph. One of the nicest walks in San Francisco is from the Caltrain Station along the Embarcadero to the Ferry Building. 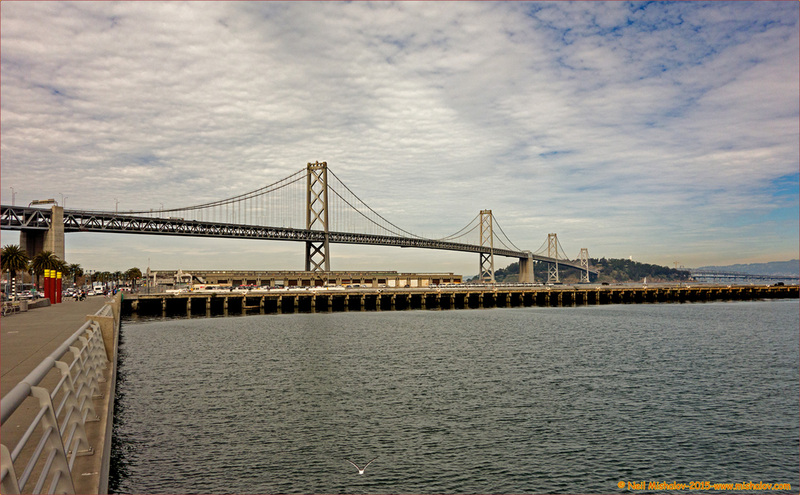 This is a view of the western span of the Bay Bridge as seen from the Embarcadero, the view is looking north. Click on the image to see the full-size photo. There are a significant number of residential and commercial high-rise buildings under construction in the Rincon Hill area of San Francisco. 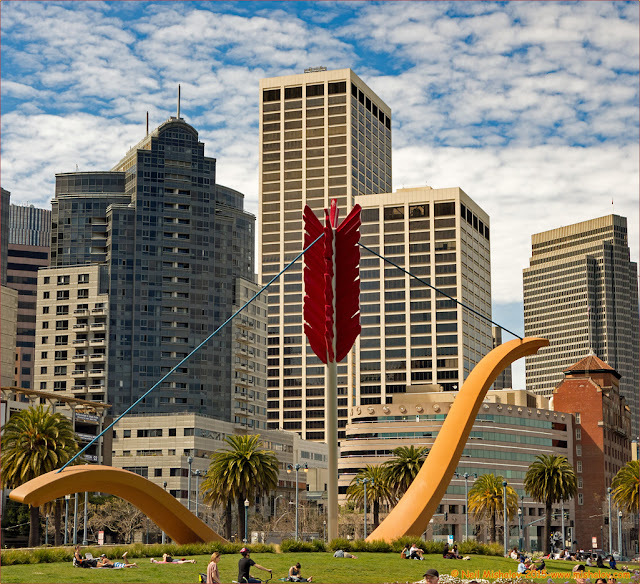 The San Francisco Giants Baseball Stadium which was constructed in the SoMa area of San Francisco became operational in 2000. Since that time there has been an exceptional amount of construction in the area. This view is looking west. Click on the image to see the full-size photograph. Cupid's Span was installed along the Embarcadero in 2002. The view is looking west. Click on the image to see the full-size photo. 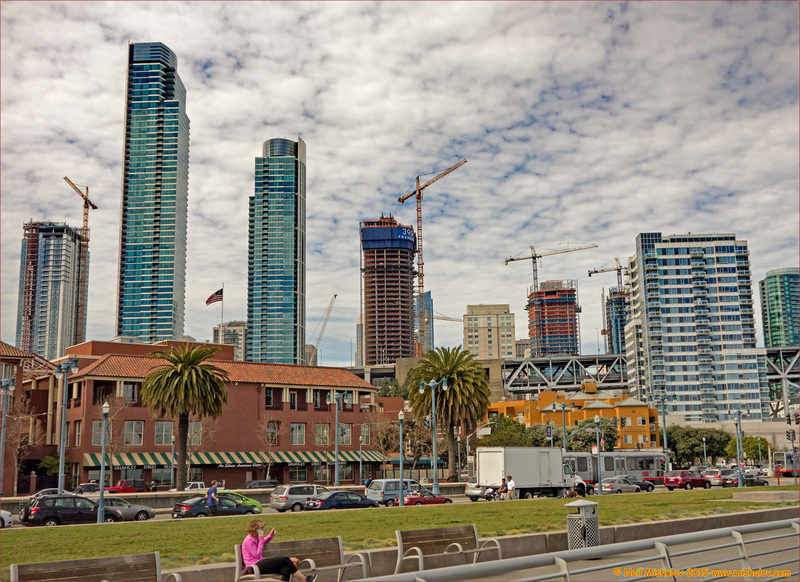 This picture was taken from the Ferry Building. The streetcars are lined up, ready to transport passengers along the Embarcadero to Fisherman's Wharf. 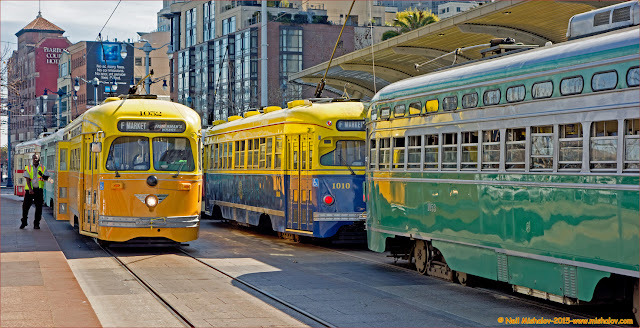 There are six streetcars visible in this picture; included are Streetcar #1010, Streetcar #1052 and Streetcar #1053. Click on the image to see the full-size photograph. 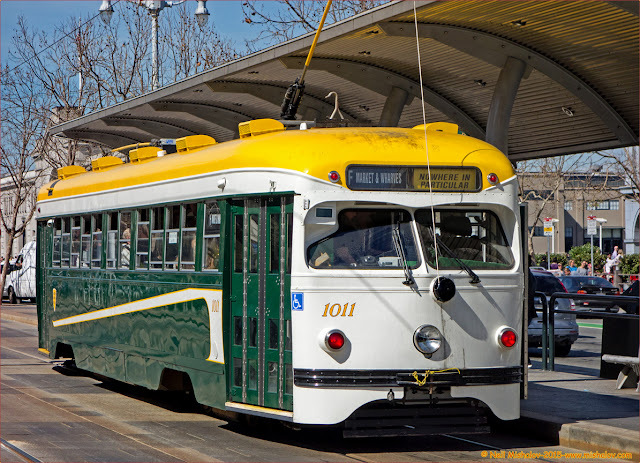 Streetcar #1011 is now traveling to Fisherman's Wharf. Click on the image to see the full-size photo. 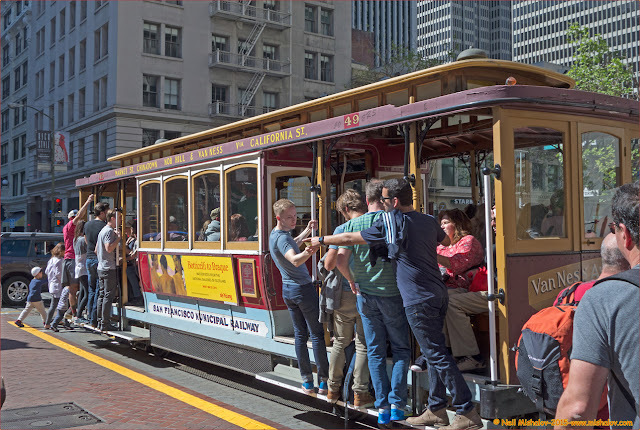 Although the cable car number is not visible in this picture, this is cable car #56. It was built in 1913 by Cal Cable. It is now loaded with passengers, and it will shortly travel up California Street. Click on the image to see the full-size photograph. The first volume of the San Francisco Bay Area Photo Blog contains galleries of photographs that were posted on the Internet between 2002 and 2011. Click Here to view those photo galleries.